The unmistakable gleaming, corrosion-resistant anodized gold of Penn International reels sets you apart as an angler who fishes with the best. The forged-aluminum spools are machined for precise alignment, and the 1-piece machined-aluminum frames provide the utmost in strength and rigidity. Powerful lever drag system features super-smooth and durable HT100 drag material, adjustable drag control knob, and freespool, strike and full drag settings. 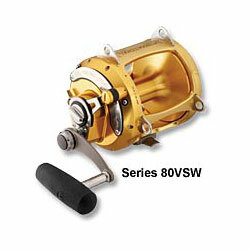 The adjustable drag clicker on the 80STW model lets you set just the right amount of tension for your fishing style. High-strength, machine-cut stainless steel gears; ultra-smooth shielded stainless steel ball bearings. All 2-speed models have the Penn exclusive Two-Speed system that lets you instantly choose between fast retrieve speed or low power speed with the push of a button. Made in USA. "Great, tough reels! They last a real long time and most tackle shops can rebuild them when they get old. They last forever." "The international series reels are built very heavy and will handle any big game fish, I have a couple that are 10 years old and look and work like new. "